Hiking is a Pacific Northwest pastime, and Vancouver USA is no exception. Trekking Vancouver's urban trails serves as a great starting point, but heading farther afield provides height-worthy explorations and stunning vistas. 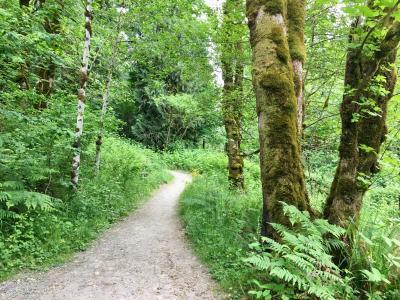 To go beyond the 20 miles of paved trails in the city, visit Whipple Creek Regional Park, which hikers have described as a deep-forest experience without the drive. Located in Ridgefield just west of the Clark County Fairgrounds, Whipple Creek is the perfect starting point for hikers of all skill levels to navigate 4.3 miles of trail through 300 acres of massive Douglas fir trees. Take the Grist Mill Loop to discover the stone wall ruins of 100-year-old splash dam and mill. The Moulton Falls area also offers close-by wooded trails with picturesque river cascades. For a truly elevated hiking experience, head out to the Columbia River Gorge. About 25 miles on Highway 14 from Vancouver USA will bring you to Cape Horn—featuring spectacular views, rocky crags, flowing streams, and two cascading waterfalls. The nearly eight-mile loop overlooks the Columbia River at 1,200 feet before dropping down to the water’s edge along fields of lava rocks. Just 15 miles north of Cape Horn, the moderate hiker can find several trails leading up to the top of Silver Star Mountain, ranging between five and 10 miles and gaining 1,240 feet in elevation. With a 360 degree panoramic view at the summit, on a clear day you can see Mt. Rainier, Mt. St. Helens, Mt. Adams, Mt. Jefferson, and even downtown Vancouver. A seasonal experience, expect to see huckleberries in the fall and wildflowers in the spring. Two-minutes up a back road from Beacon Rock you’ll find the Hamilton Mountain trailhead. The six and a half mile challenging climb gains 2,038 feet in elevation, making its way through Douglas fir old growth with run-ins with Rodney and Hardy Falls. Hike through the exposed cliff areas thriving with wildflowers in the spring and summer. Many ambitious hikers make the hour-long drive from Vancouver USA to Dog Mountain, well-known for its breezy meadows of vibrant yellow balsam root that transport you into a scene straight from The Sound of Music. Requiring some mental and physical strength, the seven-mile climb gains 2,800 feet in elevation.